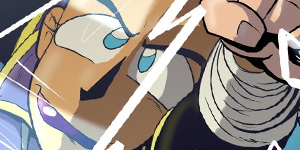 Ch4 28 – My Hero! Alright. Let me just start by saying I’m probably going to lose my temper on this one. This story follows an altruistic dimwit named Terry Lingal who thinks that being a hero means doing the right thing all the time. This goody-two-shoes lives in on a plane that looks a lot like those ‘modern’ planes, but monsters from across the various planes show up and apparently aren’t supposed to be there. So Mr. Does-the-right things is on his way to become a Knight, which I guess is a form of Champion where he’s from and he goes about, righting wrongs, slaying monsters and doing pretty much what the Champions of old would do. Along the way, he runs into a mage called Delores. They’re also joined by whatever a troubadour is named John… I think… Or maybe it’s Elton… Could be hyphenated, like John-Elton or something. They got weird names over there. I’m pretty sure most of the story is being told by the Elton-John guy. The jist of it is: the three team up and become the equivalent of a Champion and Guardian pair with a singing minstrel who pays for everything – though with more involved about the money and less about the whole ‘essence binding’ thing. Wouldn’t mind the minstrel thing, at least then I wouldn’t need to go and have to give a testimony each time a job goes wrong. Honestly, I’d prefer if it was just a split of rounds, rather than having to constantly have to the other person’s essence be pulled into the Strife. That sensation never really leave you and I’m surprised more people haven’t died to it. There’s a thing between Delores and Terry, but Mr. Chastity is too much of a pinhead to realize that he’s got a ready and willing, powerful and gorgeous woman that would do unspeakable things to him if he’d just get off his high horse and accept that sometimes the rules are made by some very twisted individuals. It’s not like she’d force herself on him or anything – that wouldn’t work with a powerful woman. Only the crazies force themselves onto others. Trust me. The art’s good. It’s got a style that grows on you and you can see the creator is honing his talent throughout the story. The story has been going on for over ten years and it’s a timeless classic as far as setup goes. Truth be told, Terry gets a heapful of reality throughout the story, thus slowly tarnishing his ‘knight in shining armour’ motif and making him start to question everything he ever believed. Like they say: If you ever see a knight in shining armour, don’t trust him. It means he’s new. So, I’d recommend people who like episodic adventures that lead to a ‘save the world’ type scenario to take a look at this one. It’s cute, got a good structure, likable characters – even if one of them is so green about being a hero, and overall, it was well worth the read. From what I can tell, it’s getting close to its climax, so now would be a good time to pick it up. After having read this story, I’m starting to wonder if perhaps the Chronicles of Lark were lifted from tales of individuals like Terry. Mainly because I’ve met the so-called Hero Lark and he’s almost the exact opposite of what the books depict him. Terry is good, does the right thing and doesn’t expect a reward – just like all the stories of Lark that I’ve read. Well, almost. There’s a lot less… uh… extra-curricular activities in The Errant Apprentice when compared to something like A Lark in the Night. The Errant Apprentice takes place on a world that has delvers, dragons, and what they call Orcs, but resemble savages a lot. All they’re really missing are those weird necklaces of fingers they like to wear. Creeps me out – I swear some of them still wiggle. Right, so, Terry Lingal goes on a heroic journey to join what is essentially The Order of his world. Along the way he meets the awesome Delores and gains the assistance of a troubadour named Elton. The three of them have grand adventures that begin to start unveiling some seriously important stuff about their world and how things work over there. Terry and Delores are an adorable couple. I know I kept reading just to see how long it would take the thick-headed Knight to admit that he had a thing for her. Not going to spoil if her ever does, but it’s well worth the read. For what it’s worth, I’d trade my Champion in for Terry. There would be less collateral damage, more rounds to go around and at least Terry is smart enough to use a sword when fighting giant monsters and not his bare hands. The art style is cute. It definitely adds the the humour of the comic and while it is a little rough sketched in the beginning, it’s interesting to see it grow into its. Delores looks better and better with each page that comes out and her temper and demeanor is something that I can wholly understand. The story itself is worth your time. The growth of Terry, Delores and Elton is an exceptional journey and the reveal to see who and/or what Terry and Delores are is an excellent twist. I just hope it ends like those same Lark stories I’ve read. Well, okay, I hope it ends mostly like one of those stories – less The Lark going on to his next job and more ‘Terry and Delores hook-up and no one dies’ kind of thing. I see a running gag here. Everyone assumes Hasera is doing her job even though she isn’t. Well, Lark never seems to get hurt regardless of what happens, so clearly his guardian is doing an awesome job of keeping him untouched. The only other explanation is that he’s got some powerful double-edged curse/blessing thing that makes him invulnerable, but that’s just crazy talk! How else would explain Lark being able to walk off a poison that’s capable of incapacitating a weaved Savage? What does it mean to be weaved (woven?)? I was curious about the difference between weaved and woven. “Weaved”, according to the dictionary, has to do with turning from side to side in order to avoid objects, while “woven” has to do with making fabric. I didn’t know they were separate words. My confusion grows greater. The appropriate use of the word in this instance is woven. To be weaved in the world of Alteria is to have your essence pulled apart and to have more essence put in. It’s a very painful and incredibly delicate process for if any mistake is made, you could end up your muscles hanging off your bones in the wrong way. Every one of the races have a different base level of essence. With the highest natural pool being Sermali’s Seraphs and the lowest being the Neutrals. There are outliers in every circumstance, but the general breakdown of unwoven races, from highest to lowest is as follows: Dragons(Almost extinct) -> Seraphs -> Abyssals -> Savages -> Unclaimed -> Elves -> Delvers(?) -> Cursed -> Neutral. For Unclaimed, their essence is actually a portion of the Goddess Cindrani, who has given them this essence as a gift. Delvers are often times considered to be on the lower end of the scale, but their knowledge of forbidden Godspells often times makes people question if this listing is accurate. Elves constantly weave themselves in minor, cosmetic, and often times enhancing ways. This is why almost every Elf always look as though they are at the physical peak of perfection – that is, until it all goes wrong. For this reason, most Elves’ rank higher on the chart than shown, but their natural levels are actually quite low. If people increase their strength, or read books or otherwise experience life in interesting ways, one could argue that they’ve increased their overall essence. But even the strongest or most brilliant person in Alteria’s essence pool would be that of a shallow puddle in comparison to a Champion, who has been forcefully woven, or weaved, as the slang is in this world, to the point that their body has reached maximum saturation. To go beyond this point would more than likely unmake the individual – yes, this has happened. In order to even begin the weaving process, A Champion-in-training must have already reached the maximum, natural potential that their unwoven bodies, but be young enough that their bodies can withstand the addition of more essence. This means that Champions-in-training, prior to getting woven are already skilled in combat and are in peak physical and mental conditions. Any less and results could be catastrophic. Half of those who are selected to be Champions do not make it past the weaving portion of the process. (The apparatus is literally called the Essence Loom). Those that survive, but have had a serious error are often found among the administration staff or custodial staff. If the weaving goes awry in a rather unflattering way, these would-be Champions are kept hidden away – doing monster-wrangling or other jobs that the public are not privy to knowing about. Those that don’t survive are forgotten and those that do survive go on to gain additional training in the ways of being a Champion and are passed on to the next tier of Champion training – live exercises. That sounds very dangerous, but also really cool! Or perhaps not boom tomorrow, but boom in the future? Always boom in the future. Oh, right! We still need the boom! Oy! That makes my brain hurt. I thought studying quantum mechanics back in grad school was complicated. What? Unmaking someone’s very fabric of existence, modifying it, and putting it back together properly is easy, isn’t it? Let me guess, a champion and his guardian share their essence ? Meaning that Has might have access to Lark’s essence .. and The Lark has a LOT of essence. Or, the more obvious possibility … Hass is a “failed” champion. Which would still mean that she has plenty of essence left. I’m going to guess that magic-users don’t necessarily use only their own essence to do stuff. Most fantasy settings have magic as a kind of background field, with which attuned folks can interact. Depending on the precise fantasy setting, such interaction can be associated with varying degrees of effort and tired-ness. Hasera is clearly a magic-user, apparently the daughter of a famous mage (and we have no data yet about her mother, so what if she was a mage, also?). The story so far does not seem to have presented us with Hasera running into some kind of limit with respect to using magic. A possible modest spoiler: The “beginning a new chapter” page, at the start of the current chapter, shows a point in the current fight with the two Abyssals, and Hasera appears to be wielding her ice mace (that she used before against the wyrm). So, I’m expecting the magic she is about to invoke will bring forth her ice mace. Well, yes, but they use “godspeak” to access this extra magic .. and Hasera hasn’t been speaking Godspeak. Maybe she’s a “tacit” caster? Casts non-verbally? Actually, it does in the core of stars. Not on living beings, though (that we know of). Characters who do the wrong things just to have a different character are just as bad as those who always do the right things. No, actually they are worse. It’s really annoying to see all this hipster-like love for something only because it’s different from something else. Both are quite boring and fake. But with the over-supply of authors trying very hard to make characters flawed merely for the sake of having flaws, I’m even inclined to pick a boring goody-two-shoes hero over a fake-bad-boy antihero. Totally true. That’s why characters need clear-cut motivations, goals and personalities. Deciding a character acts a certain way just because of plot, or “it’s cool” will quickly grind on the audience. This is it. We’ve found it. We’ve found the norm for the rest of the story. I’m so happy. I’m going to guess that one of Lark’s guardians sacrificed themselves to counteract a curse that some other foe was casting on him which ended up bonding their essence to his and altered the curse in the process. So now he is neigh invulnerable and a danger magnet. It’s better to send in a guardian that has good offense rather than have them waste defensive buffs and heals on him since he can’t get hurt. I don’t think Lark knows about it himself otherwise he’d tell the council to stop wasting guardians on him. As for Hassera, I think Hassera’s ice isn’t essence based making it so she can use it as often as she wants. She seems to be the perfect guardian for Lark since he can tank and she will be DPS and there’s no real need for a healer. I’m going to guess that her power comes from being from a powerful Arch mage’s blood line. If my theory is right then cool, if not, go ahead and point out the flaws so I can work on a new one. Given Lark’s attitude towards having Hass assigned to him, it’s possible that he’s tried even without knowing about the near-invulnerability. He may even have a carefully-hidden death wish – if he died, that might stop the danger magnet side of his curse from getting people killed around him. Or is he simply trying to justify how and why the poison didn’t kill Lark?